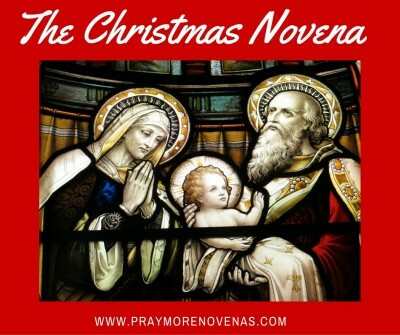 Here’s Day 6 of The Christmas Novena! For peace in the world every day. For an end to volience and bad wars when they break out let there be peace. Lord heal my wounds and bring peace in my family. I join my needs and prayers with all who are praying this novena. I am in great need right now and paralyzed by fear. I know this is not from you, Lord. Please pray for me that fear, anxiety and worry be lifted and removed from me in Jesus’ name. Dear Lord, please grant that the letter I received be a mistake and that nothing will come of it. Please help me to trust in you Lord and not be afraid. Heal me Lord and give me peace of mind. Help me to pray when I feel this way and rescue me from this. Also deliver me from evil in the form of depression, anxiety, loneliness and despair. I know these emotions are not from you Lord. Strengthen me so that I move forward, do your will and maintain my purpose in praying for others. Heal me from whatever gets in the way and grace me with some consolation and your presence Lord. Jesus I trust in you. Blessed Mother, please intervene with my emergency novena. St. Michael, please pray for me and protect me from all evil. St. Padre Pio, pray for me. Please pray for a calming of my fears and for peace of mind. I praise you and thank you dear Trinity. In Jesus’ name. My mother gave me up for adoption 70 years ago instead of having an abortion she also gave up my brother I always thought she didn’t love me enough to keep me but she did the right thing now that I think a about all the abortions she was strong I pray . I now pray for others who think they aren’t strong to search there hearts and turn to the Blessed Mother for strength and Jesus for the courage to see Jesus this tiny baby who was born to save us all . Merry Christmas and God Bless the little children. I pray that I find and start a new job that pays more than what make now. I pray that I complete my dissertation successfully so I can graduate. Prince of Peace continue to grow in our hearts so that we can exhibit to the world your works and Joy. Most Merciful Lord and Savior of the World hear these prayers for all families who are broken with sadness this Christmas, especially from separation! The situation where a elderly couple of nearly 60 years of marriage couldn’t be treated in the same nursing home. A glitch in the health system that caused this separation. May this Correction be hastened in Jesus’s Holy Name for Christmas! Heavenly Father show my brother, David that God will use this circumstance to bring his entire family closer to Him. May the family faithfully recite the Rosary daily together. Heal all the hurts in the family,suffering from Joe’s actions. Heal Joe this Christmas with a miracle of complete healing from his substances abuse and withdrawal. Draw Joe to a new understanding of a God fearing lifestyle. My Lord, and my God, I know that you will take care of this situation, as You’ve taken care of my fourteen years of chronic back pain! I thank you most Powerful Glorious Merciful Father. Thank You Father for Jesus. You sent Jesus to show everybody the Truth, and The Way. The Truth will set us FREE. Oh Glorious Prince of Peace, fill all hearts this Christmas with Your Peace. Praying for my husband to be filled with your Grace this Christmas! Removed all signs of anxious behavior from him and fill him with a calm beyond all understanding. Remove it all Oh Lord, in Jesus holy Name. I pray the worry goes away and You fill me with Your Peace n Grace! Have Mercy on me Lord have Mercy. Praying for good Blood work to be normal, hear my prayers! Praying for son, daughters, husband and myself. I pray for love in my family in the beginning of the new year. I pray for peace and love at my work place for the beginning of the new year. My prayer intentions are for peace. Peace to begin and strengthen with the Prince of Peace for my family and within all families. Praying that that peace may radiate from our families to our communities and from our communities to the world. Thank you Lord, our founder of true peace.